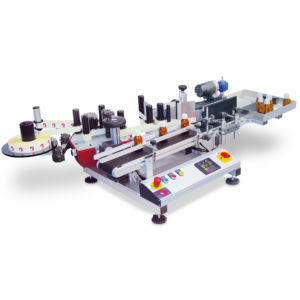 Semi-Automatic Labelling Machine, the GER 50 is a small and portable bench labelling machine. It comes with a choice of models: Wrap round labeller for cylindrical containers with the printing head in a horizontal position. In addition a top labeller able to label tops of containers with the printing head in a vertical position. Hence come with a conveyor belt and have synchronised but variable speeds of up to 20m/min with optical label detection and are able to handle label reels up to 250mm diameter by 115mm wide.